“Dr. Cobain really listens to the desires of his patients and balances that with the treatment that is best. I am really pleased with the outcome of my treatment.” — Judy R.
“We really liked the personal attention we received at Cobain Orthodontics. Dr. Cobain is very hands-on and involved in every visit. He made our visits enjoyable. Everything was explained very well regarding the different phases and appliances. 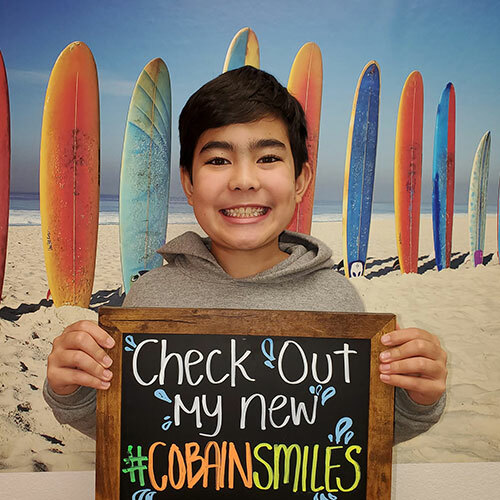 Dr. Cobain and his staff are always so friendly and courteous.” — Jeannie C.
“Everyone at Cobain Orthodontics is very polite and courteous. They were very patient in explaining my daughter’s treatment and payment plan that worked best for both of us, and they dealt with the insurance companies so that I didn’t have to! Dr. Cobain is very professional, patient, and thorough. I’m very excited to see my daughter’s new smile!” — Michelle L.
“Two words: Beautiful work!” — Janet Z. “My daughter was a lower jaw surgical case with Dr. Cobain and we had great results!” — Tracy K.
“Just last week someone complimented my daughter on how lucky she was that her teeth were ‘so perfect,’ and I thought, ‘How lucky she was to have such a great orthodontist!’ ” — Dominique C.
“Dr. Cobain is very patient. He understood my real life challenges and helped me realize my goal of being ready for dental implants.” — Bina S.